A re-imagining of an earlier space opera starring Lorne Greene, Ronald D. Moore's Battlestar Galactica surprised everyone with its intelligence, intensity, humanity, and scope. Rolling Stone, the National Review and TIME all crowned it the best show on television, and it won numerous awards including 3 primetime Emmys® and a Peabody. Join the crew of the aged Galactica as they fight to protect the last of humanity against the Cylons. With Edward James Olmos, Jamie Bamber, Katee Sackhoff, and Mary McDonnell. 75 episodes, about 70 hrs, 25 DVDs. All 73 episodes are included in this collection. Dozens of extras from all 4 seasons are included. 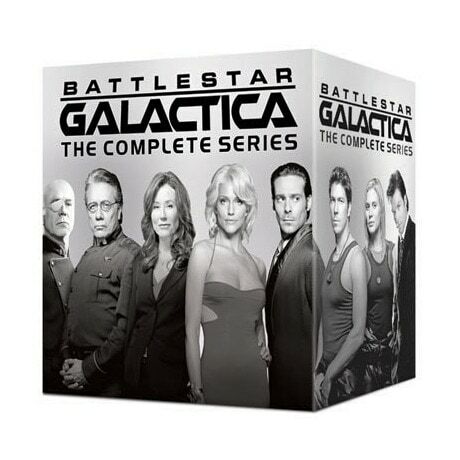 Battlestar Galactica is the recipient of 89 industry award nominations and 37 industry award wins including Primetime Emmys and two prestigious Peabody Awards.